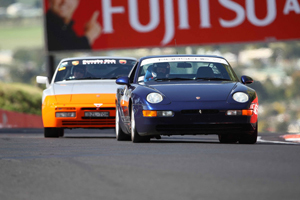 The Porsche Category Regularity event will again be held as part of the 2016 Bathurst Motor Festival, an event which will be held under the International Sporting Code of the FIA and the National Competition Rules of CAMS - CAMS Permit No. tba. Initial Registrations to hold a position will only be accepted with full payment of holding deposit and with all details on this registration accurately completed, including a valid state Porsche Club membership number. All fees include GST. Competitors will be required to have reasonable track experience on a race track in order to compete – a minimum of 3 CAMS sanctioned supersprints (or equivalent) in the past 2 years. The CAMS guidelines stipulate that the slowest car should be no more than 130% of the fastest nominated time. Further, under specific regulations for the Mt Panorama Circuit, there is currently a minimum lap time (fastest accepted) of no faster than 2:37.